The sun shone on our recent inaugural Anglesey TREC competition and a fantastic time was had by all, despite the challenging terrain! We would like to thank our fabulous landowners and the Anglesey Drag Hounds for all their help, and have plans to return to the island for more TREC events in future. The results are now available on our Results page, well done to all the winners. The schedule is now available via our Calendar page and entries are open for our split venue competition in August/September at Alconbury/Tur Langton. Our Anglesey competition is confirmed to include Levels 1, 2 and 2A for both individuals and pairs. The route has been planned and checked and the Traceur reports that the POR route goes through a beautiful area with fabulous views! The schedule and entry form are now available on the Calendar page, and there is also a link to the online entry system. If entering online you will need to pay separately, full details are given on the form. Any queries or suggestions should be sent to entries@trecgroup.co.uk. Riders and volunteers alike basked in the sunshine at the National Forest TREC competition on 19-20th May, and all enjoyed a well-organised competition in beautiful surroundings. Thanks go to Jackie and Lynne for their tireless efforts in setting a great POR and challenging MA and PTV courses, not to mention keeping competitors and judges very well fed! The Young Riders judged willingly all weekend and there were all manner of interesting fund raising activities for the International teams – Liane ran an excellent quiz alongside the Saturday night social and there was an honesty tombola and Guess the Weight of the Cake competition. The results of the TREC competition are available on the Results page, well done to all the winners and those who picked up qualification cards for the GB Championships later in the summer. The results from the competition at Park Farm over Bank Holiday weekend are now available on our Results page. Many thanks to all our valiant helpers, who we were pleased to find needed sun cream more than waterproofs on the day! We couldn’t have done it without you, so huge thanks to you all. As previously published, we have an enormous number of entries for Park Farm this year. Because of this we have had to dramatically change our timetable, which is below. We are putting on an extra dinner, on Saturday, for those competitors who wish to partake. The cost will be £10, please let me know numbers by emailing entries@trecgroup.co.uk. Also we have not had much uptake for the Sunday night dinner, and Claire is a bit worried that, as we are using on line entries for the first time, some may have been missed. Please let us know if you have booked or would like to book, we don’t want anyone to go hungry. Performance Equestrian are bringing their stand for both days, for anyone who wants to update some of their kit. 5pm Venue open for ONLY for those Levels 3 & 4 who have a long journey. Please email entries@trecgroup.co.uk if you wish to arrive on Friday. 4 pm approx. Level 1 prize giving. Provisional results will be published within an hour of the last competitor completing and there will be 30 mins for queries. The prize giving will happen on completion of that query period. 7.30 pm Dinner and results for Levels 2, 3 & 4. Followed by prize giving. There will also be the CTG Winter series awards presentation. Central TREC Group are holding an Equine Specific First Aid course on Sunday 29th April in Wellesbourne near Warwick. The course covers all aspects of emergency first aid and leads to a nationally recognised FAA Level 3 qualification. Places are available to all CTG members, please email helen.martin@trecgroup.co.uk for full details and to book a space. We are also hoping to hold a Judges’ training course on 9th or 10th June, watch this space for venue and timings. This course leads to qualification as a TREC GB probationary judge and is free to all CTG members (riding and supporter members). The results in the Central TREC Group Winter League 2017-18 have now been worked out, well done to all our members who have competed over the winter. If the points were gained from the same number of classes, the total score for each counting class is totalled and the highest total wins. If the riders/pairs are still tied, the number of riders beaten is worked out and the rider/pair who beat the largest number of other riders wins. The Frank Trophy is awarded to the CTG member gaining the highest PTV score in a TREC GB league class at any CTG arena TREC. Riders and pairs who are 1st to 3rd in each league will receive engraved glasses and the Frank trophy is a silver salver, kindly presented last year by Bella Craven. The prizes will be presented at Park Farm so we hope to see lots of you there! We have had a bumper crop of entries for the Park Farm competition which opens our 2018 summer season – nearly 100 riders are heading to Stanford on Avon for the Bank Holiday weekend! Thank you to all those who have offered to judge or are bringing judges so that the event can take place. Claire is busy figuring out the logistics and timings to get everything in (and finish before 8pm on the Sunday!) so please watch this space and your email inbox for any amendments to the plan. This competition includes a night-time POR, so there are increased requirements for visibility for this section. Riders competing at night will need to have high-viz on their torso, which MUST include reflective strips/ material. Riders are strongly encouraged to wear light(s), this co uld be a head torch or torch on the body for example. 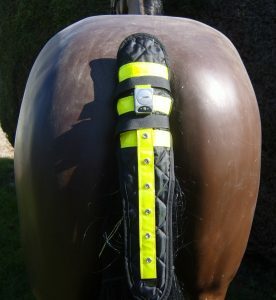 Horses must have high-viz equipment too, which must include reflectives visible from the front (such as a neck strap) and a light visible from the back (eg a flashing tail guard or similar). Entries for this competition are closed, but riders (and volunteers) are welcome to request meal tickets for the Sunday night or corralling if they have not already done so. Please email entries@trecgroup.co.uk to request these extras. Details of how to pay via BACS transfer or PayPal may be found on the schedule. Gracelands rounds off the season – in the sunshine! In contrast to wintry Willicote, the sun shone on our final Arena TREC of the 2017-18 winter season at Gracelands Equestrian Centre! The results are now available on the Results page and the placings in the 2017-18 Central TREC Group Winter League will be published shortly. Thanks go, as ever, to our valiant judges and helpers for making the day possible. We hope to see you all at our Winter League presentation of awards, at Park Farm on Saturday 4th May.